A high performance transformer based magnetic volume control. It features two highly acclaimed attenuating transformers and Swiss made ELMA switches point-to-point hand wired into a custom case. It changes output level via passive control in multiple steps to control the volume of high fidelity audio. This passive control unit, by applying transformer technology, offers a material improvement over all previous such schemes based around resistive attenuation. The concept of passive control units replacing active line preamplifiers has existed for some time. Conventional passive preamplifiers have relied on resistive networks selected with a switch or rotary variable resistors. The fundamental problem with this type of device is substantial mismatches of impedance either at the source or the load, coupled with a perceived loss of dynamics. 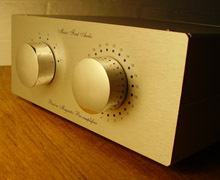 The Music First Audio Passive Magnetic Preamplifier overcomes these problems by using a high quality, custom made, hand wound transformer. This transformer features the largest commercially available 80% nickel Permalloy core for maximum level handling, low distortion and superior sound quality and a heavy duty Mumetal shielding can for protection from external magnetic fields.